Substitutional solid solutions are formed by the replacement of atoms A in a host lattice by foreign atoms of element B (the atoms are substituted). In many cases, the solubility of an atom species B in A is limited. However, under certain conditions, each B-atom can be replaced by an A-atom which is referred to as a continuous solid solution series or complete miscibility since the solubility of the metal A in B can be up to 100%. 1. Both metals must be of the same lattice type (e.g. bcc – bcc). 2. The difference in atomic diameters must not be more than 14%, the atomic radii must therefore be about the same. 3. Both elements must have low chemical affinity for each other, such as between adjacent elements in the periodic table. Generally, the atom species involved are indifferent to each other, i.e. there are no directional, attracting or repelling forces and the atoms B are distributed in the host lattice with statistic irregularity (Fig. 1a). 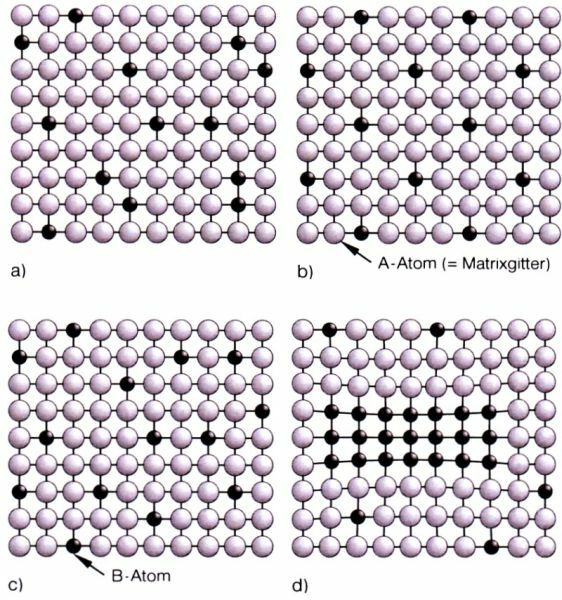 However, if the attracting forces between the different atoms A-B is higher than between atoms of the same kind A-A and B-B, this results in the formation of an ordered superstructure (Fig. 1b). This atomic configuration is also referred to as long-range order and is only possible for certain fractions of the dissolved atoms. Upon thermal exposure, this long-range order can easily be destroyed as the system strives to achieve the disordered state (the state of maximum entropy) when at high temperatures. Vice versa, e.g. during cooling or solidification, a superstructure can only form at a low cooling rate since reaching an ordered state requires many site changes and therefore sufficient time. Ordered structures will not form at a high cooling rate. The properties of superstructures are significantly different from those of solid solutions having an irregular structure. Due to the lattice distortions caused by the dissolved atoms B, completely irregular distributions are practically never formed, instead so-called short-range orders are created (Fig. 1c). In this case, the dissolved atoms B are much less frequently adjacent to each other than probability would dictate. By applying an appropriate heat treatment (see Heat treatment of hardenable aluminum casting alloys, Hardening), further special distribution states of the dissolved atoms can be obtained, e.g. in the form of clusters or single-phase decompositions (zone formation, see Fig. 1d). As a result of the various atomic diameters, a relative large area in the vicinity of these decompositions is strained, leading to a considerable increase in strength. Bargel H. J., Schulze G. (eds. ), Werkstoffkunde, 10th edition, Springer Verlag, Berlin Heidelberg, 2008.